Alien is a masterpiece of practical effects work. At 40 years old, the film’s set and creature designs hold up perhaps better than any other sci-fi film of its era. With little in the way of a marked trail in front of them, director Ridley Scott and his crew consistently had to invent new and convincing ways to bring to life the horrors inflicted upon the crew of the Nostromo. Sometimes this meant innovative lighting or editing or costume design. Other times, as a new article from Entertainment Weekly explains, this meant Scott getting elbow deep in a bunch of sheep and cow guts and moving them around with his hands. 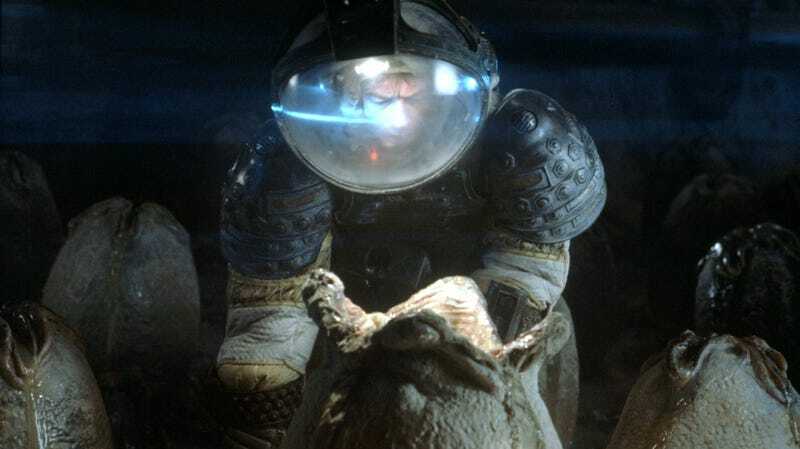 In the film, John Hurt’s Kane approaches one of many eggs found on an alien spaceship, prompting it to slowly open and reveal a churning, pulsating interior. This shot is essential: For the first time in the film, Scott tips his hand as to just how fucked up things are going to get. And, according to art director Roger Christian, that pulsating took some time to get right. Working off a design from Swiss artist H.R. Giger (who designed the full-grown Xenomorph as well), Christian’s team achieved the egg’s organic look by stuffing the shell with sheep intestines, which were then covered in a casing of cow stomach lining. Despite creating the world’s biggest, most terrible ballpark frank, the crew struggled to give their monster life. Eventually, Scott quite literally rolled up his sleeves and did it himself, putting on some rubber gloves and reaching up into the egg to give the shot the movement it needed.